Home to one of the Seven Natural Wonders of the World, Victoria Falls, Zambia charms all who visit this wonderful and diverse country. As soon as you arrive in Livingstone, Africas adventure capital, you’ll be charmed and well looked after by the wonderful local people. Zambia is home to what is arguably the best white water river on earth. From the start of your adventure beneath Victoria Falls, this is a trip with it all. 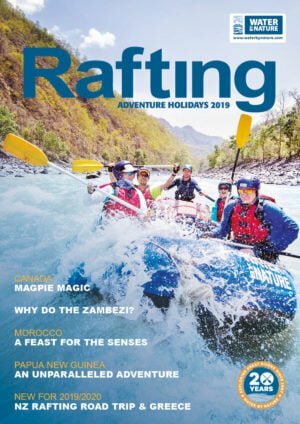 Great fun, warm white water rapids, stunning beaches to camp on, a spectacular lodge to spend your last night in as well as a stunning helicopter ride through the Batoka gorge retracing the route you took by raft. Zambia is so much more than a natural wonder and a river. You’ll see incredible wildlife during your holiday, sometimes even from your hotel! As a river, The Zambezi has quite a reputation. Come and visit this wonderful country and superb river with our team of international river professionals, you will appreciate the difference they make to your adventure. Gourmet meals and spectacular sundowners will make travelling to this wonderfully destination truly worthwhile. This is the real Africa. AS OF 2013, THERE HAS BEEN AN AGREEMENT BETWEEN ZAMBIA AND ZIMBABWE TO BUILD A HYDRO-ELECTRIC DAM 56KM DOWNSTREAM FROM VICTORIA FALLS. WHILST THE DAM ITSELF HAS YET TO BE STARTED, ROADS AND PRELIMINARY WORK HAS BEGUN. WE SUGGEST VISITING THIS WONDERFUL RIVER SOONER RATHER THAN LATER TO EXPERIENCE IT IN ALL IT’S SPLENDOUR.